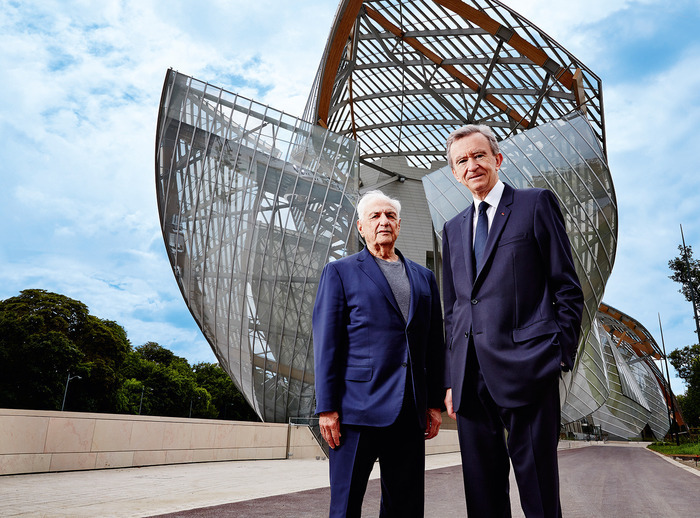 Bernard Arnault is the billionaire chairman and chief executive of LVMH Moët Hennessy Louis Vuitton, the largest luxury conglomerate in the world with brands including Louis Vuitton, Bulgari, Dior, Fendi, Givenchy, and Dom Pérignon. He is also a prominent art collector with a collection including works by Monet, Picasso, Henry Moore, and Yves Klein. 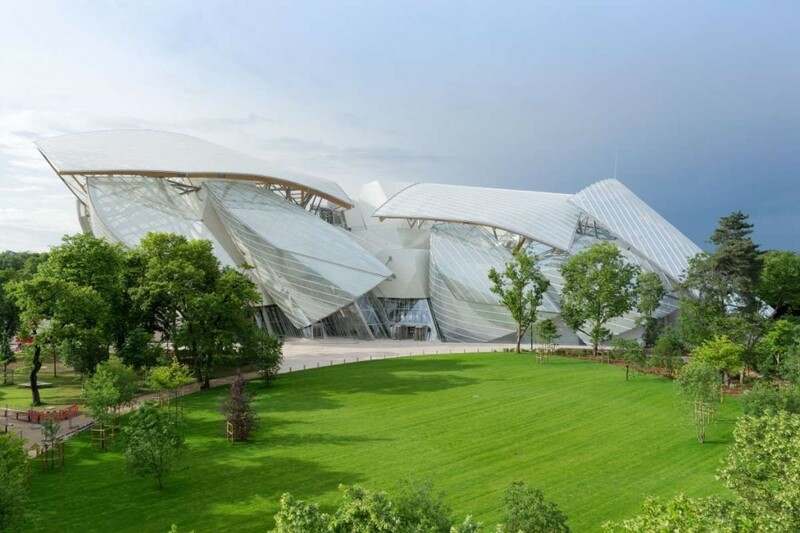 Arnault selected Frank Gehry to design his museum after a visit to Gehry’s best-known project, the Guggenheim Museum in Bilbao, which is archetypal of his deconstructivist style with striking (but functionless) exterior forms wrapped in metal. 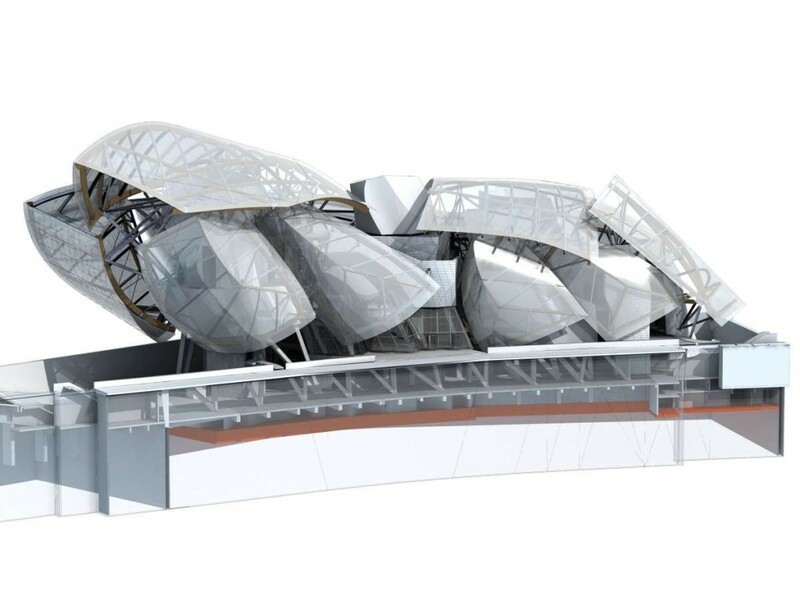 Other major projects from Ghery include the Weisman Art Museum in Minneapolis, the Walt Disney Concert Hall in Los Angeles, and the forthcoming Guggenheim Abu Dhabi. 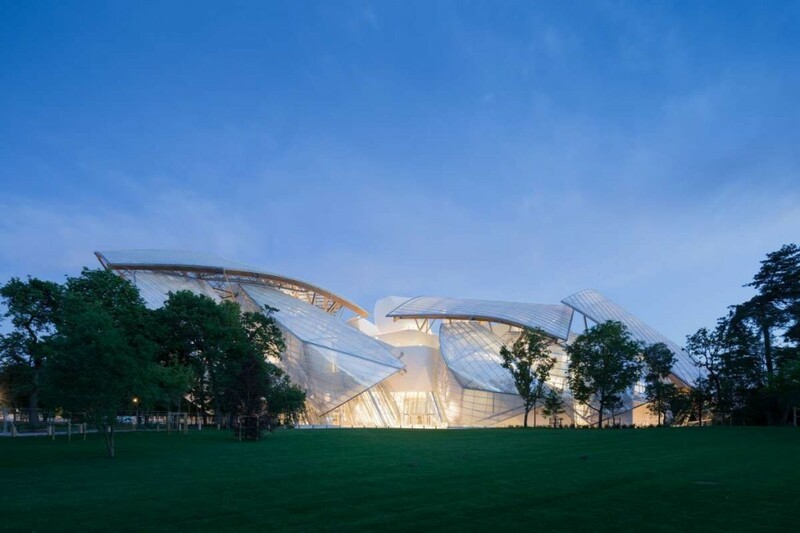 For the Fondation Louis Vuitton, Gehry designed an assemblage of blocks, described as icebergs, surrounded by immense glass panels described as sails. The white iceberg blocks are clad in 19,000 individual panels of fiber-reinforced concrete, and twelve sails, on a frame of steel and wood beams, are comprised of 3,600 individual panels of glass. The building totals 126,000 square feet, containing eleven galleries, an auditorium, and an entrance hall, restaurant, and bookstore. Construction began in 2008 and it is reported that costs have exceeded $135 million. The building has achieved a HQE (Haute Qualité Environmentale) certification of Très Performant, which is considered equivalent to LEED Gold. The ground-level entrance hall opens onto a water garden in the Jardin d’Acclimatation to create an active social space in the transition between the building and the landscape. The building’s position in the Bois de Boulogne is noteworthy. At the western edge of the posh 16th arrondissement of Paris, the Bois de Boulogne is the city’s second-largest public park and borders the Seine between central Paris and La Défense. 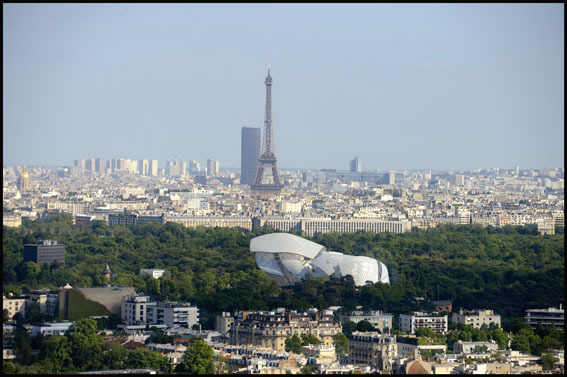 Above the treetops, the Fondation gains views onto the city beyond. From afar, the shimmering glass building appears as an oversized and abstracted orangerie. The site remains a public park, and the Fondation has been granted a 55-year lease so that the building will revert to public ownership in 2062. The museum’s first exhibitions will be announced only a few days in advance of the opening, but some speculations are on installations by Olafur Eliasson, Taryn Simon, and Sarah Morris. 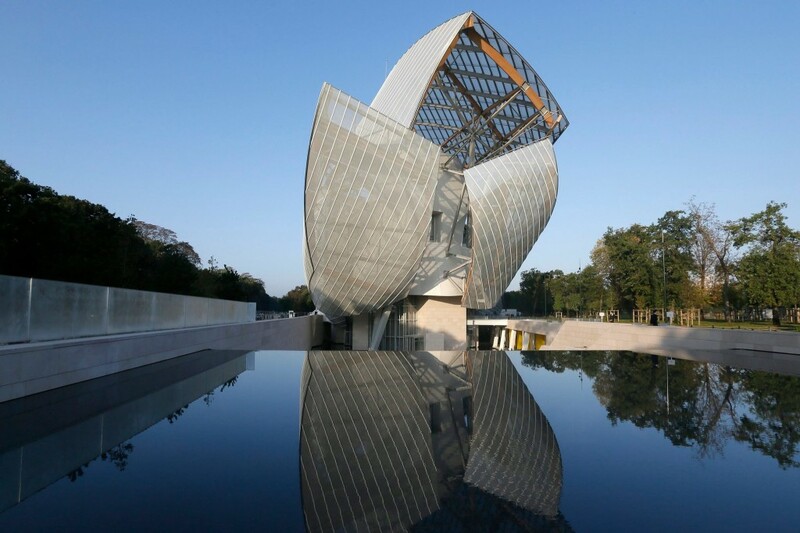 The Fondation’s permanent collection includes works by all three, and many others including Francis Bacon, Damien Hirst, Jeff Koons, Yayoi Kusama, Takashi Murakami, and Richard Serra. The museum for the Fondation Louis Vuitton is an expansion of LVMH and Arnault’s cultural patronage, which includes the Open Days initiative in which luxury brands open their ateliers to the public; the LVMH Young Fashion Designer Prize; a series of internships and degree programs with professional schools that aim to cultivate a new generation of designers and craftspeople; and a range of commissions and sponsorships. Much of this follows a philosophy that luxury brands, with an association of heritage and tradition, can ennoble themselves by supporting arts and culture.